What are the causes of RLS? What is Restless Legs Syndrome? The Definition of Restless Legs Syndrome: Restless legs syndrome (RLS), also known as Wittmaack-Ekbom's syndrome, is a condition where legs feel uncomfortable and may have a crawling sensation after going to bed. The sensation results in an irresistible urge to move or jerk the leg. Alternative Names for Restless Legs Syndrome? Long periods of inactivity - long journeys etc. Approximately 80% of people with Restless leg syndrome also suffer from Periodic Limb Movement Disorder (PLMD). 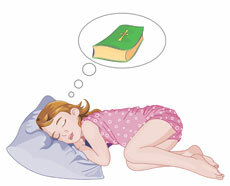 The sole purpose of the article on a sleep disorder such as Restless Legs Syndrome is to act as a reference guide to provide useful information regarding sleeping problems. It is not intended to be used to diagnose or treat Restless Legs Syndrome or as a substitute for obtaining professional medical advice. Please remember that if you are in any doubt about your health please consult your medical practitioner immediately. This information regarding sleep and sleeping disorders is not intended to replace the advice of a doctor. 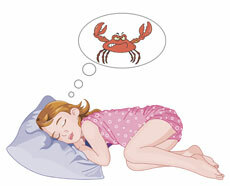 Dream Interpretation.org.uk disclaims any liability for the decisions you make based on this information.